All products that are disseminated through the COST action TU 1206 Sub-Urban are available here. “The vision is for Future Cities that live sustainably and in harmony with the ground they are built on. Relevant policy at local, national and trans-national scales will be needed to support this.» Dr. Diarmad Campbell, Chair of COST Action TU 1206 Sub-Urban, BGS. 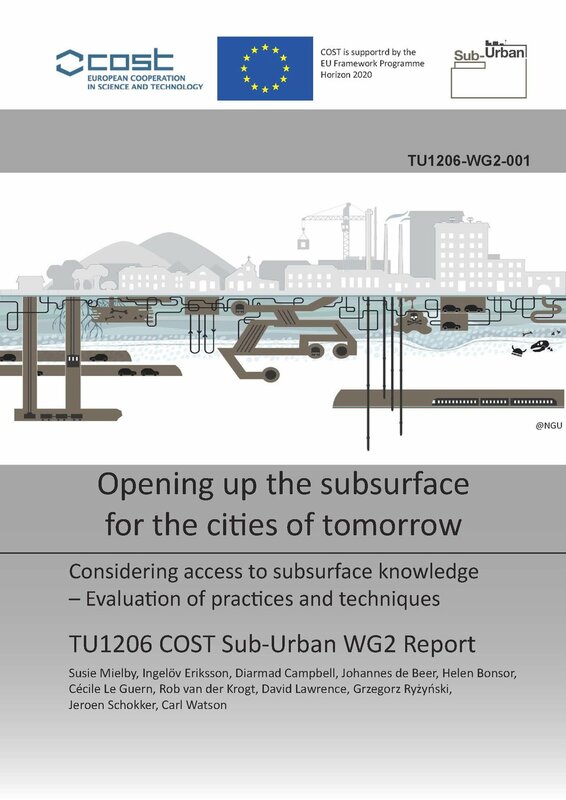 Read the Summary report TU1206-WG2.0-001 Opening up the subsurface for the cities of tomorrow. the result of COST Action TU1206 Working Group 2, Work package 2.3, and focusses on 3D urban subsurface modelling and visualisation. The major aims of this report are: 1) evaluating current techniques and identify good practices / best efforts in 3D geological modelling and visualisation of the urban subsurface, based on case studies, and 2) co-developing (subsurface specialists & model users) requirements for optimal use of 3D geological modelling information in specific planning and policy contexts. Cities that are partners in this Sub-Urban group has made a Case Study of their city are presented here. The list will continuously be updated. The subsurface is an important constituent of the physical environment of cities. We live on top of it; building and construction have to deal with the structure and properties of the subsurface, and occasionally with the hazards it presents. Cities not only expand outward and upward, but also downward. More and more, subsurface space is used to relieve the increasingly crowded and congested urban surface, especially for networks (metros, tunnels, cables, sewage, drainage), storage (warehouses, cellars, parking lots, thermal energy), and exotic applications such as shelter and protection (nuclear bunkers, bank vaults, underground passageways in cities with harsh climates). The more use we make of subsurface space, the more surface space we free for the one function that cannot do without daylight and fresh air: living. In addition to the concrete results, COST Action Sub-Urban is successful in creating a community of practice between the geoscience and the planning communities, involving cities, universities and institutes. To some extent, the project is already improving the conditions for urban subsurface planning, especially where communication, mutual understanding and awareness raising are concerned. For better impact, however, this will have to be extended to decision makers and the general public. Read the summary report TU1206-WG1-001 Out of sight out of mind? The Basel region, which borders both Germany and France, is one of the most dynamic economic regions in Switzerland and acts as a vital regional as well as interregional traffic junction. Moreover, Basel has a variety of natural environments as well as highly vulnerable groundwater systems in river valleys and adjacent karstified areas. Environmental changes include the development of subsurface infrastructure (e.g., tunnel highways) and urban subsurface structures in general which permanently impact groundwater flow and thermal regimes. The existence of evaporites and mixtures of marl-bearing evaporites in the Triassic formations as well as the fact that Basel is located in the seismologically most active area of central Europe come along with the potential occurrence of geohazards. Some of these hazards are natural whereas others are triggered by human activities. In this report the case studies for Bergen city, western Norway, are described. We are presenting facts about the city, the administration and the role of responsibility in the municipality with respect to planning and decision making. Furtheron the physical geography and geology of Bergen city area is described, providing the basis for the problems addressed in the case study of Bryggen in Bergen (ca. 2000-2015) and the newly started case study of the medieval city of Bergen, including Vågsbunnen and its appurtenant issues. Here, the main emphasis is on describing the background of the ongoing sub-urban project in Bergen and the success story of Bryggen in Bergen. The issues to address in the future work are numerous. Laws and regulations will be evaluated during and because of this work. The aim is to build knowledge about the subsurface, to emphasise its role in urban planning and to develop a communication of data that is accessible for all parties who play a role in planning the urban area. Dublin is Ireland’s capital and largest city with a population of 527,612 (2011) and it lies on the East coast of the Ireland (Fig1). The Dublin metropolitan area is Ireland’s financial and administrative centre. Dublin is the hub of Ireland’s transportation networks and a key gateway for international trade via air and sea. The Republic of Ireland has a total population of c. 4,588,000 and of that population c. 1,273,000 live in Co. Dublin making it the most densely populated part of the country. the 20th century a decline in heavy industries such as ship building and mining led to population decline, dereliction of land and social deprivation. Since the early 1980’s, regeneration, restructuring and development have promoted an economic revival of the City. Regeneration of Glasgow’s economy, environment and social fabric through the promotion of sustainable development, social renewal and improvements in health continue to underpin the planning strategies for the development of the City. supply in the City of Hamburg. This case study wants to provide a picture of geological, hydrogeological and modelling data in Hamburg and the established workflow between BSU Geological Survey, BSU Water Management department and Hamburg Water, the state-owned public water supply company of Hamburg. City of Helsinki is the capital of Finland and one of the most densely populated areas in the country. Together with its surroundings it's called Greater Helsinki. It consists of metropolitan area including smaller urban Capital Region and commuter towns. These regions are located in the southern part of Finland, on the northern coast of the Gulf of Finland (Figure 1). The Capital region includes cities of Helsinki, Vantaa, Espoo, and Kauniainen (Figure 2) and has a population of about one million. Many of the city’s buildings are centuries old, and infrastructure is likewise aging and though the city has strong technical expertise and political will to undertake upgrades, it also faces financial constraints from the global economic crisis. The lack of space led to the expansion of the city to the suburbs as well as to the occupation of less favorable terrains, leading to cost increases. The solution was the construction in the consolidated city, in height and depth, namely to promote better conditions to inhabitants (basements, underground parking and subway tunnels). However this implies detailed knowledge about subsurface characteristics, which was gathered through survey campaigns. Using this information Lisbon Municipality has been developing a geotechnical database to generate a 3D geological/geotechnical model, aiming cost reduction and new projects optimization. Ljubljana is the capital and largest city of Slovenia, population 282,994 (2012) with an area of 10,000 m2. It has a central geographic location within Slovenia. Green areas from the hinterland extend into the historical city centre via green wedges and riparian corridors giving Ljubljana its distinctly green identity. From geological point of view is the area of Ljubljana part of Ljubljana Basin - tectonic depression, formed by tectonic subsidence and gradual filling with alluvial and lacustrine sediments. 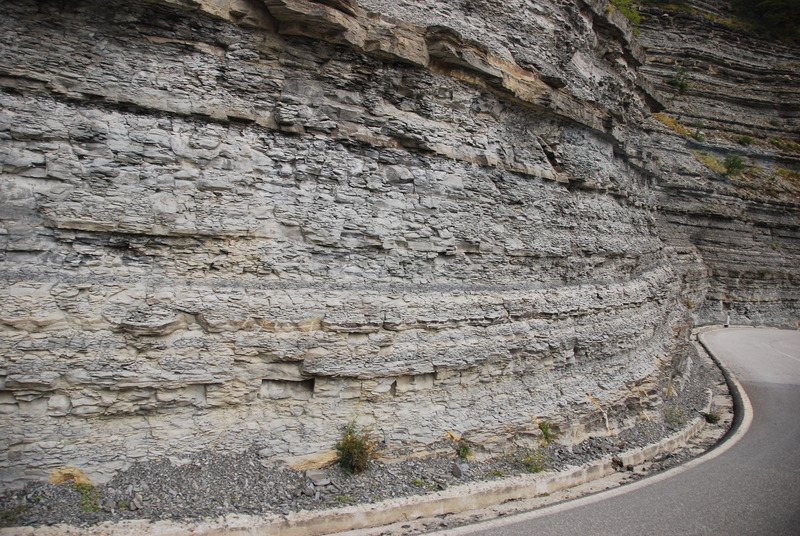 The sediments are composed of well permeable gravel and sand beds with lenses of conglomerate. Due to the great thickness and good permeability, this sandy-gravel aquifer contains significant quantities of groundwater which is main resource, exploited for the public water supply of the city Ljubljana mostly without any treatment. The city’s main development objectives are defined in the Municipal Spatial Plan (2010). City development is directed mainly at regeneration and renewal of existing developed areas and is also committed to resolving issues concerning safeguarding and development of green and open spaces. The most important objectives are to safeguard and manage the five green wedges in the city that link the city centre to the hinterland. Nantes is the France’s sixth largest city. The conurbation (Nantes Métropole) comprises 600,000 inhabitants, and should reach the 700,000 mark by 2030. The Loire River, and the closeness of the Atlantic coast played a key role in the city's history and development. In the past, the economy was driven by the city's shipyards and maritime industry. Today, the city's industry and economy have undergone profound transformations that have provided an opportunity to redevelop large urban areas, especially in former industrial sites like in the Ile de Nantes, while protecting the fragile eco-systems of the Loire estuary. The Novi Sad territory has been inhabited by humans since the Stone Age (about 4500 BC). A settlement was located on the right bank of the river Danube in the territory of present-day Petrovaradin. In antiquity, the region was inhabited by Illyrian, Thracian and Celtic tribes, especially by the Scordisci. Celts were present in the area already in the 4th century BC and founded the first fortress on the right bank of the Danube. Later, in the 1st century BC, the region was conquered by the Romans. During Roman rule, a larger fortress was built in the 1st century (Cusum) and was included in the Roman province of Pannonia. at the same time. Thirdly, there is pressure from the subsurface: due to a rise in groundwater level caused by increased recharge, diminishing needs for potable water / lesser water abstraction and the sealing of previous leaky sewers which hereby stop acting as drains. contain enhanced levels of radium and uranium. swamps, lakes and large parts of an inland sea have been turned into polders and in many places dikes strengthen the coastline. Without dikes nearly the whole western part of the country would be flooded. To keep the reclaimed polder areas dry and fit for farming, pumping stations – formerly windmills – extract water continuously and transfer it to bordering water bodies. As a drawback, water extraction leads to compaction of soft soils and oxidation of shallow peat layers, resulting in a gradual lowering of the land surface. Vienna is the capital of Austria and its cultural, economic and political centre. It is composed of 23 districts. Famous for its classical music, classicist and modern architecture, Art Nouveau buildings, imperial palaces, the State Opera, theatres, the traditional Viennese coffee houses and the Lipizzaner horses, Vienna attracts up to 6 million tourists per year. It is the home of over 100 museums and 13 universities as well as the seat of several United Nations offices (e.g. OSCE, OPEC, UNIDO and IAEA). According to the statistics of the International Congress and Convention Association, Vienna is the second most popular congress location worldwide, hosting up to 200 international conferences annually. Regarding life quality, the city was ranked as the second most liveable city worldwide in several 2015 surveys. As a global smart city, it reached third place among European cities in a 2014 ranking. Short-term scientific missions (STSM) are exchange visits between participants involved in Sub-Urban, allowing e.g. scientists and city partners to visit an institution, laboratory or city partner in another participating country. Each STSM has resulted in a short scientific report. Click on the images to download the reports directly. STSM-TU1206-24340. Development of concepts for management of thermal resources in urban areas. STSM-TU1206-16598. Improving the delivery and impact of groundwater and wider subsurface data. Review of database requirements to support groundwater and integrated modelling. The establishment of national register for all subsurface data (BRO) within the Netherlands by TNO is a hugely significant body of work and forms a benchmark case study to the COST Sub-Urban Action in data management and use. Geschreven door Floris Boogaard (Hanzehogeschool Groningen, Hogeschool Rotterdam, Tauw), Rick Heikoop, Kaj van de Sandt, Tijmen den Oudendammer (Hogeschool Rotterdam), Arjen Oostra (gemeente Rotterdam). op 25 januari 2018. By Constantin Radu Gogu, Diarmad Campbell, Johannes de Beer (2017). Procedia Engineering 209 (2017) 1–3. Goal. Despite these goals, the potential importance, and contribution, of the subsurface to sustainable urban development, and clean water and sanitation, is often unrecognized, or misunderstood, and at worst ignored. Most cities around the world face issues related to geology and urban hydrogeology in particular, requiring attention at least as much as those provided by other planning related problems in urban areas. Currently, European cities face many consequences resulting from a lack of accurate and detailed knowledge of the underground environment and the interaction between the urban groundwater and urban infrastructure. These are core themes of this Special Issue. The papers in this Special Issue emanate from the “Urban Subsurface Planning and Management Week” – SUBURBAN 2017 - held in Bucharest, Romania from the 13 to 16 March 2017 and hosted by the Groundwater Engineering Research Center of the Technical University of Civil Engineering, Bucharest, Romania. The European COST Sub-Urban Action (TU1206) has had the fundamental aim of closing the knowledge gap between subsurface experts and potential users of subsurface knowledge - urban decision- makers, practitioners and researchers. The Action assembled a network involving >30 countries, 23 actively participating cities, researchers, practitioners and urban decision-makers, and brought together the fragmented research and good practice across Europe in sustainable urban sub-surface use. Development of national exemplars has been encouraged, and good practice identified to inspire others, using a lighthouse-follower approach to cascade knowledge and good practice across Europe and further afield. Experts from both sides of the knowledge gap were brought together to assess and synthesise the state-of-the-art in lighthouse cities with respect to urban sub-surface knowledge, understanding, and use of that knowledge. This was achieved in 19 City Studies, with findings encapsulated in an over-view report “Out of Sight - Out of Mind”. COST (European Cooperation in Science and Technology) Action TU1206 Sub-Urban has explored sustainable use and management of the urban subsurface, and the use of subsurface information in urban planning and development. A part of the Action (Working Group 1) has assessed the ‘state-of-art’ in cities; another part (Working Group 2) has evaluated practices and techniques. Both have considered access to subsurface knowledge in cities. A network was established by the Action with more than 100 participants in total; and in Working Group 2, there were more than 50 participants. Working Group 2 has resulted in 6 full reports and a summary report. The Action’s Working Group 1 undertook comprehensive city studies. These established that the subsurface was in effect virtually ‘Out of mind, out of sight’ with respect to planning and management and there was a significant knowledge gap to fill. The task for Working Group 2 was to improve this situation. This paper is based on the work drawn together in the Working Group 2 Summary report ‘Opening up the subsurface for the cities of tomorrow’. This deals with good practices in urban subsurface planning and management; and how the urban subsurface planning and management processes can be improved in the future. The current state of knowledge in relation to soil and subsoil geochemistry (when available) is overwhelmingly based on surface (topsoil) and very near surface sampling of subsoils. This is expressed in the form of 2D mapping, based on interpolation between sample sites. 2D topsoil acquisition is particularly well suited for addressing health issues; deeper geochemical sampling is required more typically in relation to urban (re)development, construction work and remediation of contamination. 3D geochemical knowledge, although as yet uncommon, could be very useful in optimizing urban redevelopment projects, anticipating contamination problems, and managing excavated materials (e.g. local reuse possibilities, disposal costs etc.). Because all of these aspects can have important economic, environmental and social consequences, they are considered essential for urban sustainable development. To meet these future 3D, and potentially even 4D (temporal and predictive) needs, improved development of data acquisition, management, visualisation and use of these are crucial steps. City growth threatens sustainable development of cities. Over the past decades increased urbanization has created more pressure - not only on the suburban outskirts - but also in the inner core of the cities, putting important environmental issues such as water management and cultural heritage under stress. Cultural heritage, either standing monuments or archaeological remains, is internationally recognized as an important legacy of our history. The European Convention on the Protection of the Archaeological Heritage incorporates concepts and ideas that have become accepted practice in Europe. Conservation and enhancement of archaeological heritage is one of the goals of urban planning policies. One of the key objectives of the European policy is to protect, preferably in-situ, archaeological remains buried in the soil or seabed and to incorporate archaeological heritage into spatial planning policies. Conflicts with prior uses and unappreciated impacts on other subsurface resources, amongst them archaeological heritage, make use of underground space in cities suboptimal. In terms of ecosystem services, the subsurface environment acts either as a carrier of archaeological heritage in situ (stewardship) or supports above-ground cultural heritage. Often, it’s not enough to protect the heritage site or monument itself: new developments outside a specific protected area can lead to changes in groundwater level, and cause serious damage to heritage buildings and archaeological deposits. This paper presents good practices in cultural heritage management and the use of subsurface knowledge in urban areas. planning and the knowledge of the underground. In particular, attention is paid to the treatment of the underground in the current planning and its importance in urbanism and local planning. The ACUUS, the Associated research Centers for the Urban Underground Space, was established in Montreal in 1997 to promote partnership amongst all actors involved in the planning, design, construction, management and research on urban underground space. To explain how ACUUS has become an international organization over the years, and recognized by UN-Habitat, the evolution of global attention on underground space since the 19th century, with the gradual arrival of national and international organizations dedicated to the underground. Based on personal experience as a municipal planner, ways in which urban underground space should be planned and managed are described. The underground should be a place for people as much as for tunnels and public utilities. 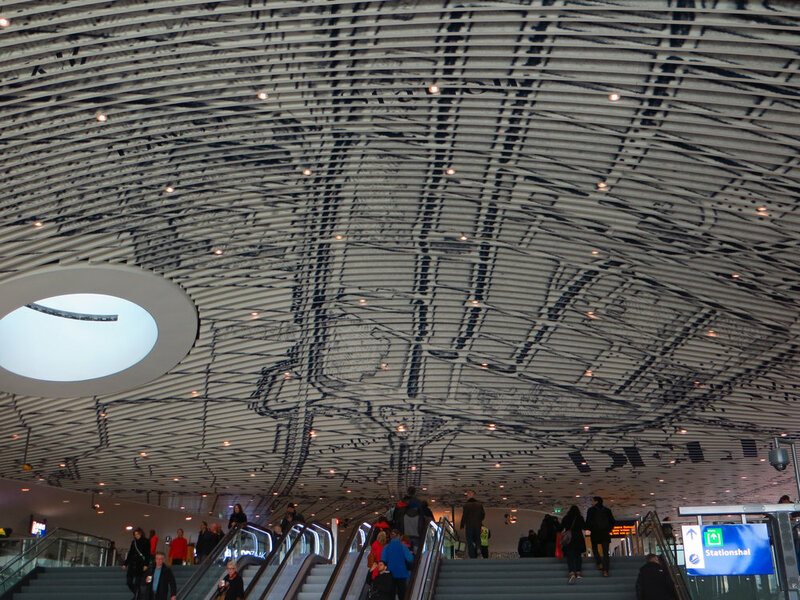 Montreal Underground City, one of the largest of its kind in the world, is used to demonstrate how, since 1962, underground use can evolve and the sub-surface can be “humanized”. Some global trends are described, and challenges that need to be overcome in order to “populate” the underground, are also highlighted. flood modelling using DEM is carried out in 2017 and in 2009. We can observe that the technology behind tools using DEMs is becoming more common and improved, both with a higher accuracy and a higher resolution. Visualization tools are developed to raise awareness and understanding among different stakeholders in Bergen and around the world. We can conclude that the evolution of DEMS is successful in handling bigger datasets and better (3D) visualization of results with a higher accuracy and a higher resolution. With flood maps the flow patterns of stormwater are analysed and locations are selected to implement (sub-)surface measures as SuDS (Sustainable Urban Drainage systems) that store and infiltrate stormwater. In the casestudy Bergen the following (sub-)surface SuDS have been recently implemented with the insights of DEMS: settlement storage tank, rainwater garden, swales, permeable pavement and I/T-drainage. The research results from the case study Bergen will be shared by tools to stimulate international knowledge exchange. New improved DEMs and connected (visualization) tools will continue to play an important role in (sub-)surface flood management and climate resilient urban planning strategies around the world. The sub-surface, with its man-made and natural components, plays an important, if not crucial, role in the urban climate and global energy transition. On the one hand, the sub-surface is associated with a variety of challenges such as subsidence, pollution, damage to infrastructure and shortages of space for new urban systems. On the other hand, the sub-surface presents opportunities in terms of solutions for flooding, reduction in heat stress, and decentralized energy systems. Therefore, it is necessary to place sub-surface issues in their appropriate perspective, to enable a more resilient design that brings together ecosystem services, climate and urban systems, and which takes full account of the dynamics of the subsoil. To achieve this, the sub-surface must be an integral part of above ground planning and design. Organization of the sub-surface needs to be reflected visually in relation to - consideration of (surface) spatial morphology. The objective of this paper is to question the role of architectural representation of the subsurface. Discussion of architectural representation should include ‘design thinking’. An important element of design thinking is the concepts that are used to guide the design process. For this reason, this research tests the role of visualization in relation to a case from the Dutch context and more specifically to subsidence. The approach is built on a systematic processing of contextual information of the site under development, using the System Exploration Environment, Subsurface and results in a Technical Profile. Using input from subsurface specialists to rethink the urban landscape results in realisation of synergies between subsurface elements and the (re)design of vital urban infrastructure. Many urban areas in Denmark are facing rising groundwater levels due to decreasing groundwater abstraction, greater rainfall and rising sea level due to climate change. Therefore, solutions for handling excess surface water and groundwater in urban areas are needed. To ensure a good background for a continued and sustainable handling of the urban water cycle, special attention has to be paid to the development of geological/hydrogeological models of the subsurface as a basis for management and planning. A 3D geological/hydrogeological modelling tool for handling the urban water cycle within Odense City has been setup in a collaborative effort involving authorities and private stakeholders. With Odense City as a pilot area the developed tools and the gained experience has been made available for other cities facing similar challenges. This paper introduces the Odense Model, presents the major project considerations during the construction, and briefly presents the model results, the developed tools for urban planning/management and the project considerations concerning the continued use and maintenance of the model. Shallow subsurface resources are progressively used for the production of geothermal energy, i.e. for the installation and operation of a broad variety of Geothermal Energy Systems (GES). Additionally, in many urban areas there is a surplus of heat from large buildings and constructions reaching into the groundwater saturated zone. Likewise, groundwater is more often used as a cheap cooling medium. As a result, significantly increased subsurface temperatures have been observed in many urban areas. Several studies investigated how the so-called "Subsurface Urban Heat Island" (SUHI) effect and how current thermal subsurface regimes developed. However, a sustainable management of subsurface resources requires a general understanding on how “current thermal states” of subsurface and thermal regimes developed in context of different urban settings and boundary conditions. These aspects yet are mostly unexplored. In practice mitigation measures are generally taken for individual projects. Thereby, a consideration of the broader context of hydrogeological and thermal processes and boundaries and the interacting thermal activities could lead to a more sustainable use of subsurface energy resources. Besides providing an overview of subjects related to the thermal management of urban subsurface resources this review paper summarizes the results from different research projects that have been realized in the densely urbanised area of Basel in northwestern Switzerland. of protection options for the important groundwater resource of the City of Ostrava in the Czech Republic. The resource is threatened by the impacts of long-term contaminant releases from a number of industrial enterprises in its neighbourhood. Due to the complex hydrogeological settings and man-made impacts, effective protection of the Nova Ves groundwater resource requires careful co-ordination of mitigation measures at individual sites. It was proved that long-term pumping intensity (140 l/s) does not guarantee protection of the water quality. A reduction in the pumped discharge to 120 l/s was recommended. To ensure the long-term water quality in the water withdrawal area without any restriction on pumping discharge, a reduction in ammonium in the vadose zone by the 50 % would be required. However, so far, no remediation activities have been started. Ljubljana is the capital and largest city of Slovenia. It has been developed in the vicinity of the Sava River on an alluvial plain that for more than a century has been used as a local resource for drinking water. Thanks to the natural hydrogeological conditions and protection measures, the groundwater beneath the city is still the city’s main resource of drinking water. The city’s growing energy demands initiated the search for new alternative sources of energy which could contribute to the reduction of CO2 and other health hazardous emissions. In this respect, the ground beneath the city, the groundwater especially, offers favorable conditions for the implementation of ground-source heat pump systems, which represent one of the key technologies of renewable energy for heating and cooling. The city’s future challenges regarding the subsurface will be related to the sustainable and efficient use of all resources and the avoidance of conflicts in their mutual use, in which drinking water resources will be of paramount concern. In the City of Odense we have plenty of water issues, but we do not have any real “burning platforms” that can turn the focus of our politicians and other relevant people in our direction. We experience pressure from all sides: Annual mean precipitation have increased 100 mm (15%) during the last 140 year. Extreme rains occur more often and they are becoming more intense. Surface runoff causing flooding in streams and rivers or from storm surges in the fjord area. Sometimes both occur at the same time. Rising groundwater level caused by increased recharge, diminishing needs for potable water / lesser water abstraction and by reducing the amount of excessive waters, e.g by restoring leaky sewers, which hereby stop acting as drains. resources (groundwater abstraction, gravel excavation, drainage), infiltration, SUDS. One of the key elements is that the natural conditions and the human activities often act in conjunction, causing greater problems rather than less problems. The rapid and expanding urbanization during the 20th century, have forced a deployment of well fields from early urban locations to more rural locations. This have affected the groundwater level beneath the city, so it is significantly higher today. Urbanization also affects the natural water cycle by increasing and accelerating the surface runoff, which puts further strain on the older joint sewage system under the central parts of the city, causing local flooding during heavy rains. When you consider the predicted climate changes in the future with increased intensity and volumes of water, these problems will only become worse. One of the main activities causing subsidence in the urban environment is the dynamics of groundwater due to abstraction and recharge as well as its interaction with subsurface infrastructure systems. For a sustainable spatial planning, the complexity of urban environment demands the utilisation of new methods for monitoring and quantifying the effects of the underground processes. One of the remote sensing methods developed in the last decades, offering the opportunity for early detection of land subsidence in urban areas is the interferometric synthetic aperture radar (InSAR). By its different techniques, this method started to be used in correlation with several underground and ground measurements for revealing diverse parameters characterizing the dynamics of groundwater, including seasonal and long-term aquifer-system response. Considering both groundwater and underground structures, an overview of several studies realised in different sites, based on InSAR techniques, is presented. Urban winter hydrology is generally poorly understood, despite the large number of cities which have annual seasonal snow cover and there are only few studies about urban snow and snowmelt rates in the cities. Two specific factors affecting the snow melting rate in urban areas are the degree of urbanization and the urban snow distribution. The net radiation balance of urbanised catchments differs from their rural counterparts. The choice of a snowmelt model for a particular application depends on data availability and snow characteristics. A review of attributes of common snowmelt models is presented for evaluation and selection of the best suited model for simulating snowmelt in a specific area. In snowmelt computations, the challenge is to identify a suitable model for the heterogeneous urban conditions from the existing model categories as TIM, EBM, or their combination as a hybrid method. For rural environments, empirical methods (TIM) have been demonstrated to reproduce a large part of the snowpack variations at both open and forested areas. For heterogeneous urban environments, it is necessary to apply an EBM in order to take into account all the characteristics of urban snow. Snow properties such as density and albedo vary both between urban and rural areas as well as between different urban locations belonging to the same urban agglomeration. developments, groundwater protection, and environmental impact. The feedback from these studies increase further the city scale model knowledge and accuracy. A direct hydraulic connection between the surface water and the groundwater has been systematically confirmed. Bucharest City is the capital of Romania and also the biggest city. Situated in an alluvial plane, the geological settings are represented by a series of overlaying Quaternary strata of aquifers and aquitards. Some of these aquifers are used for water supply (the deeper aquifers) and the shallow and medium ones are characterized by an intense interaction with the urban infrastructure. The paper presents the drivers and also the architecture of the urban groundwater monitoring systems developed in the last years in order to observe the urban impact upon the first two aquifers layers. The anatomy of the system is correlated with the urban infrastructure. Also the paper presents the future monitoring system that will be develop within a European JPI project. Groundwater is an essential resource for water supply. For this reason, it is necessary to integrate and harmonise efforts to protect groundwater quality with socio-economic activities and existing land-use patterns in any given region, as well as complying with the requirements of the EU Water Framework Directive. In addition, land management seeks to coordinate and harmonise policies with regional impacts. Water—as a public good and an essential resource for the development of life and the evolution of populations—needs to become one of the main pillars of management for a variety of regional policies. Therefore, water resources planning does not make sense without firstly considering forecasted land management patterns. The objective of this work is to standardize the process of managing the supply systems and prove their quality by certification. This will require guaranteeing the sustainable management and obtaining the certificate. During this long process, there may be complications that prevent achievement of the ultimate objective. For this, it is necessary to promote a standardization tool, which will value the efforts of the various agencies involved in the protection and management of groundwater used for human consumption in achieving sustainable management of water resources. Selection of the optimum solution for drinking waer supply is very difficult operation, considering the constraints generated by presence of many factors which influence the selection process. In order to select the optimal solution multi-criterial analyses have to be performed, considering technical, institutional, environmental and financial aspects for each analyzed option. Such an analysis was carried out for the development of a water supply system for all localities of two rayons, Calarasi and Straseni, located in the central area of the Republic of Moldova. In the context of the ongoing worldwide efforts directed to achieving environmental sustainability by mitigating environmental challenges and reversing the depletion of the environmental resources, the work presented in this paper has the purpose to identify the most effective solution for ensuring access to good quality drinking water for the localities in the southern part of Constanta County, Romania. At present, the communities in the analyzed area are using drinking water abstracted from ground water sources which have registered continuous quality degradation over the last 30 years, while the water losses in the water supply systems are high. As the existing water treatment facilities are unable to remove the pollutants found in the raw water (ammonia, nitrates, Iron and Manganese), within a complex regional project which aims at the same time for reduction of water losses and reaching drinking water quality compliance, a comprehensive analysis was prepared, in order to identify the most efficient solution for supplying the localities at the border of the Black Sea with sufficient and appropriate quality water. This paper shows the systematic approach used for conducting the options analysis in which there have been considered different applicable solutions ranging from decommissioning the existing sources and construction of a regional water supply local treatment, to keeping the existing sources and construction of new appropriate treatment facilities or blending water from multiple sources. The conducted analysis has revealed that the most feasible option for long term sustainability of water supply is the construction of a regional water supply system supplied by a very good quality wellfield with additional flow input from an existing water treatment plant having spare capacity available. Simultaneously with the social and economical transformations within urban areas, the operating and functioning conditions for all the components of water and wastewater systems have modified in a specific manner in each area. One important aspect of these changes is the adjustment of pumping stations operating parameters to the new water network demands so that the operating costs of these pumping stations achieve a sustainable level for the water companies. In this context, the paper presents the results recorded by upgrading and rehabilitating the pumping stations for an urban water network with a primary goal of diminishing the operation and maintenance costs and a secondary goal of reducing the water losses in the water distribution network. An effective way to identify the main elements that can provide an image about the efficiency of a system is to compare your performance level with that of another similar system. Therefore, water and wastewater systems need a wide and reliable database that can provide such a comparison. The water and wastewater sector has become interested in the implementation of this management technique in the last two decades, in order to improve the performance of the companies in the sector, an also the Romanian operators has started the benchmarking exercise, in order to find ways to improve their own efficiency. The results of the benchmark exercise are presented in the paper, and also first conclusions drawn from the first benchmarking process. Urban drainage systems are loaded directly by precipitation and snow melting processes and their hydraulic capacity must be sufficient to be able to convey the water volumes without discharging to the surface causing flooding. Urban drainage systems are also affected by the groundwater levels by increasing the water volumes that are transported through the system. The receiving waters may also be affected by climate change in terms of higher water levels which can have significant back water effects and reduced outlet discharge capacity in the urban drainage system. Climate change may lead to an increased groundwater level which affects the urban drainage system by additional volumes infiltrated into the sewer from the underground. This infiltration may lead to a reduction of the hydraulic capacity of the collection system and in increased pressure over the wastewater treatment plant. The increased groundwater level can affect the percolation process and may lead to local flooding and reduced hydraulic capacity in the urban drainage system. from 1911, 1950, 1970, 2012 were used to create digital terrain models which allowed the terrain morphology changes to be identified and the volume of landfill materials to be obtained. This study enables the Town Hall to create constraints in land use in their Master Plan and other planning instruments to reduce cost increases and the risk of hazards. The current paper presents the use of ERT geophysical investigations performed on a construction site to investigate the presence of underground voids (old basements, embedded pipes etc.) that can cause safety and technological issues during future construction works. The data acquisition was based on 4 ERT profiles placed along the area were underground voids were expected. Some acquisition and processing challenges were encountered and the applied solutions are presented herein. The anomalies presented on profiles recorded with different electrode arrays (Wenner, Schlumberger, Dipole-Dipole) show the presence of underground voids, but the position and size cannot be determined exactly, so a reliability based approach is employed to characterize the result. Many excavations for basement construction will encounter groundwater. If not suitably managed and controlled, groundwater can cause problems for excavation and the buried structures themselves. These problems can range from nuisance seepages that reduce the efficiency of construction operations, through to major inflows that can result in instability, flooding and even collapse of the excavation. Groundwater can be a significant problem when excavating for basement construction. However, with good planning and the use of suitable methods groundwater need not be a major obstacle. the excavation may flood as a result of groundwater inflows from water-bearing layers of soil or rocks. high pore water pressures in batter slopes at the sides of the excavation may lead to instability or seepage erosion. groundwater uplift pressures beneath the floor of an excavation can give the risk of a base heave or piping failure in the base of the excavation. groundwater pressures can cause excessive hydrostatic loads on excavation retaining structures such as concrete pile walls. Dewatering methods (also known as groundwater control methods) can be used to control groundwater and avoid these problems. This is an especial problem when excavating in water-bearing soil (such as sands and gravels) or fissured rock (such as chalk or sandstone). Without suitable control measures, inflows of groundwater can flood excavations or tunnels, and can also lead to instability when the soils or rock around the excavation weaken and collapse – either locally or on a large scale. The current modern techniques allow the execution of the deep excavations in the urban zones in more difficult geotechnical and hydrogeological conditions. The transport infrastructure development in big cities leads to design underground road passages for fluidity of traffic. Under these conditions it is necessary to divert the underground utilities routes. Also, the construction of new metro sections is an alternative to public transport from the surface. New modern office and residential buildings, as well as new commercial complexes, require new underground utility projects. In these circumstances, design studies require investigations about underground utility networks, in order to avoid the damage in execution operations of new construction foundations works. These investigations allow the design of metro lines and metro station avoiding major waterways, sewers, gas or electric cables, or design first the deviation project for these underground utility networks. Georadar systems together with advanced positioning surveying, assisted by specialized software, allow fast mapping, nondestructive and precise, very useful to designers for types of construction mentioned above. This system becomes a necessity in terms of urban agglomerations in growing today. This article refers to modern systems Ground Penetrating Radar (GPR), to software for taking over of field information and to postprocessing software that lead to obtaining 3D georeferenced digital map products, integrated into a GIS. The Third Congress of Geologists of the Republic of Macedonia is taking place in Struga, organized by the Macedonian Geological Society and “Gocve Delchev” University of Shtip and supported by a number of companies and partners. In the context of the long tradition of geological science and the current momentum, the key topics of the Congress relate to: Geology and science, Fundamental geology and Geology and economy. Papers submitted to the Congress were compiled and printed in Collection presenting 105 original scientific works prepared by more than 350 authors and co-authors from Macedonia and abroad, on more than 700 pages. Their content reflects the connection between traditional research methods and application of new modern technologies and tools in geological explorations, including also the state of the art field and laboratory instrumental methods, systems for data processing and keeping, as well as environmental parameters monitoring. De Beer, Johannes (2015), presentation on the role of the subsurface in urban water management at NORDIWA2015, Nordic Water and Sewage conference, November 6, 2015. Download presentation. De Beer, Johannes (2015), presentation at seminar by International Association for Hydrogeologists on urban geology and subsurface data management, Oslo, Norway, October 8, 2015. Download presentation. De Beer, Johannes (2015), presentation at Seminar on Water and Wood seminar in Bergen on urban geology and water management, Norway, October 7, 2015 Download presentation. De Beer, Johannes (2016), presentation on the relation between subsurface and surface water management at Water Management Conference in Trondheim City Hall, February 14, 2016. Download presentation. Ganerød, G.V., de Beer, J., Seither, A. & Vik, M.B. Urbangeologi; grunnleggende for bærekraftig byutvikling. (Urban geology - fundamental for a sustainable city development) Geoteknikkdagen 27. november 2015, Oslo, Norway Book of papers: http://nff.no/wp-content/uploads/2016/01/Fjellsprengningsdagen-2015.pdf . Paper on page 468-472. Launch of the new sub-surface 3D/4D model of the City of Odense, Denmark, produced by public and private partnership, and inspired by COST Action TU1206 Sub-Urban, and led by Susie Mielby (GEUS) Gert Laursen (City of Odense, both COST partners and MC members, and Niels-Peter Jensen (COST Partner and Working Group Member). 5th October 2015 Download Article. Hva’ kan der ske, når viden ikke inddrages? Presentations by Susie Mielby (GEUS, Denmark) Gert Laursen (Odense City, Denmark, and a presentation on COST Sub-Urban Action by Vice Chair (Johannes de Beer, Norway) "Hva’ kan der ske, når viden ikke inddrages?" Download presentation. Urban soils may be contaminated not only by industrial activities but also by the materials contained in the anthropogenic deposits. In order to anticipate the management of excavated soils linked to urban redevelopment, their quality and quantities need to be assessed. Urban soils and subsoils contain nevertheless a large variety of anthropogenic deposits and present important geochemical heterogeneities. The paper aims to develop various geochemical types of made grounds relevant for a 3D urban subsurface model. Materials and methods To build a 3D urban subsurface model, using geological tools, the challenge is to define a stratigraphic pile both geologically and geochemically relevant. In this frame, we defined a typology of made grounds based on an iterative approach. We used (a) published classifications, (b) a dataset of the study area (Ile de Nantes) comprising the borehole descriptions (2400), and (c) results of analyzed samples (more than 1800), gathered in a georeferenced database. The layers (8400) found in the borehole descriptions were interpreted according to the a priori made grounds typology and to the underneath natural layers. The relevance of the made ground typology proposed was verified by a statistical approach on the representative samples and analyses selected in the database. Three types of made grounds have been retained. They show contrasted geochemistry. The made grounds that are comparable to natural subsoils correspond in the case study to alluvial type materials. They show similarity with a typology and geochemistry of alluvial materials. The questionable man-made grounds, containing potentially contaminated anthropogenic materials such as bottom ash or slag, are characterized statistically by higher contaminant levels than other types of made grounds (e.g., PAH, Zn, Pb, Cu,...). The various man-made grounds, corresponding to the remaining materials and containing for instance demolition materials, are characterized statistically by higher levels of PCBs. The typology has been used in a 3D representation of the Ile de Nantes subsoils, which served as a decision aid tool for the developer. Le Guern, C., Baudouin, V., Bridier, E., Cottineau, C., Delayre, M., Desse-Engrand, F., Grellier, M., Ménoury, A., Milano, E., Mouny, A., Pollett, S., Sauvaget, B., Bâlon, P. with the collaboration of Conil, P. and Rouvreau, L. , 2016b. BRGM Final Report RP-66013-FR (in French). L’Ile de Nantes fait l’objet d’un programme de réaménagement ambitieux sur 30 ans (2000-2030). La Samoa , aménageur de l’Ile, souhaite pour la 2ème partie du programme d’aménagement être en mesure d’anticiper les problèmes liés aux pollutions des sols. Ces derniers peuvent être liés aux contaminations issues des anciennes activités industrielles, mais aussi à la qualité des remblais utilisés. Au-delà des enjeux sanitaires et environnementaux, ces problèmes de pollution représentent des enjeux économiques importants, notamment en lien avec la gestion des terres excavées. En l’absence de méthodologie pour acquérir la connaissance nécessaire pour anticiper ces questions de qualité géochimique des terrains concernés par les réaménagements, et notamment de méthodologie nationale de caractérisation des fonds géochimiques, la Samoa s’est rapprochée du BRGM pour développer des méthodologies adaptées, avec le soutien financier de l’Ademe. - d’évaluer les volumes de terres à excaver potentiellement générées par les opérations d’aménagement à venir, compatibles avec le fond géochimique en vue de leur réutilisation, ou qui pourraient à défaut être admises en ISDIen l’absence de filière de valorisation, et de vérifier qu’elles répondent bien aux critères d’acceptation. Les méthodologiques développées dans le cadre de l’IHU concernent en particulier la gestion spatio-temporelle des données et une identification des polluants potentiels associés à chacune des sources de pollutions potentielles recensées à l’échelle de la parcelle cadastrale. L’analyse des activités, produits et procédés et leur succession permet de proposer cinq niveaux de potentialité par polluant : nul à très faible, faible, moyen, fort, très fort. Les couches d’informations géoréférencées et les bases de données associées vont être intégrées au SIG de la collectivité et être consultables par les différents services et les aménageurs à partir de requêtes prédéfinies ou créées par l’opérateur. La base de données BASIAS, outil de communication vers les citoyens, a été en outre mise à jour. Sur l’Ile de Nantes, le nombre de site recensés est ainsi passé de 94 initialement à 199 au final. Dans le cadre de la cartographie des remblais, un des challenges a été de définir une typologie de remblais ayant un sens géochimique et géologique permettant de les distinguer selon leur potentiel polluant intrinsèque. Pour ce faire, une démarche itérative a été mise en place. Elle s’appuie sur une synthèse bibliographique internationale, sur les données de sondages collectées et sur la vérification de la pertinence de la typologie par croisement avec des données de géochimie rassemblées dans une base de données géoréférencées. 3 types de remblais ont été définis. Ils présentent respectivement un potentiel de contamination intrinsèque fort, moyen ou faible selon la qualité des matériaux contenus (ex. scories, mâchefers, …). Cette typologie a été utilisée pour visualiser les différents types de remblais selon plusieurs modes de représentation (3D sous GDM, 2D sous ArcGis). Un autre challenge a été d’évaluer la compatibilité des terres avec le fond géochimique. Dans ce cadre, une réflexion a été menée sur la notion même de fond géochimique anthropisé. En s’appuyant sur la notion d’anomalie de fond géochimique, la notion de seuil de compatibilité de fond géochimique est proposée. Les calculs statistiques par type de remblai et pour les alluvions, à partir des données d’analyses représentatives sélectionnées dans la base de données de géochimie, ont permis de définir des seuils de compatibilité avec le fond géochimique anthropisé local, spécifiques à l’ile de Nantes, pour la gestion des terres excavées dans ce secteur. Les calculs de volumes en fonction des seuils de compatibilité de fond géochimique anthropisé montrent des perspectives de réutilisation intéressantes des terres : environ 300 000 m3 seraient réutilisables sans contrainte au niveau du CHU (0 et 4 m de profondeur), et environ 95 000 m3 seraient réutilisables après vérification et traitement éventuel. Des perspectives de réutilisation intéressantes s‘offrent en outre pour les sables des remblais hydrauliques massivement présents sur l’Ile (60 % des matériaux à 2 m de profondeur). L’intérêt d’une plateforme de gestion des terres excavées apparait ainsi clairement, celle-ci devant permettre de stocker les terres et de les traiter si besoin avant réutilisation. Compte-tenu du volume important de terres à excaver, un excédent est attendu par rapport aux possibilités de valorisation. Une forte proportion de matériaux apparait acceptable en ISDI (environ 80 % sur l’emprise du CHU). Les dépassements de seuil apparaissent liés en majorité à des pollutions ponctuelles, et dans une moindre mesure à la qualité intrinsèque des remblais. Une question se pose néanmoins pour l’antimoine (Sb) qui est parfois le seul paramètre déclassant. Les résultats opérationnels sont nombreux et présentent de forts enjeux économiques. Néanmoins certains verrous n’ont pu être levés dans le cadre du projet et méritent la poursuite des recherches. Les éléments acquis au cours de cette première phase pourront être affinés en phase 2, notamment pour préciser les potentialités de réutilisation, mais aussi les seuils de réutilisation en fonction de différents types d’usages. Un autre volet envisagé en phase 2 est le dimensionnement de la plateforme et l’assistance pour sa mise en place. Gogu R.C, Serpescu.I, Perju.S, Gaitanaru. D, Bica.I. "3D geological model to support the management of urban subsurface environment: Bucharest City case study"
Serpescu I, Gogu R.C, Boukhemacha M. A, Gaitanaru D.
External link to journal article. "General aspects on urban hydrogeology and highlights from Bucharest (Romania)". According to global demographics and geographical data, more than half of the world population live in cities spread over alluvial plains from river delta and lacustrine sediments. The predictions point out that urban population will rise to 60% in 2030 and 70% in 2050. In the World Bank urbanization statistics, Turkey has a growth rate of around 180% from 1950 to 2010, above the world average and the numbers still maintain the trend indicating that the average population of metropolitan area has increased by about 30%. In the past century, urbanization has become one of the key drivers of sustainable development and economic growth. However, rapid urbanization resulting from migration and population growth comes out together with social, economic and structural problems that challenge the positive development of cities as well as the opportunities. Natural and man-made disasters such as earthquakes, floods, landslides and subsidence are recognized as geohazards in cities. Urbanization by both horizontal and vertical construction suppresses the earth surface on which it rests. The ground undergoes physical change by sinking slowly. This time-dependent and slow-developing progress (which may reach from mm level to dm level annually in vertical) is closely related to geological, geotechnical and hydrogeological soil classification type that affects more or less the decrease in topographic heights. Damages and threats caused by the land subsidence on infrastructure systems have been reported in numerous scientific researches. The results of such studies and risk assessments are of interest to the stakeholders of project management and planning in cities. Working groups of geological services, universities and research institutions, planners and decision makers should collaborate to assess the potential risks of land subsidence and to make urban development sustainable. In this study, the results of land subsidence obtained from geodetic monitoring are presented in the central cities, İstanbul, Konya and Kocaeli together with the other samples in the literature. The importance of this data for urbanization is discussed, and finally general information on Sub-Urban COST activities is given. Three articles produced by people in the Sub-Urban group are published in the Spanish journal 'Ciudad y Territorio'; vol. 186, see abstracts below. All abstracts from the journal are available online here, and the entire volume is available here. Abstract: The need to include the subsurface in urban studies and planning is no longer questioned. In recent years research and projects addressing this issue have proliferated, culminating in the preparation of the COST TU1206 Suburban action, which sets as a target introducing suburban spaces into the day-to-day management of Europe’s cities. In order for this objective to be realised it is necessary to strengthen collaboration between, on the one hand, geological institutes and universities and, on the other, urban planners and decision-makers; and, of course, formulating a full theoretical agenda that will enable the latest developments in subsoil models and mapping to be put to good use in local urban-planning departments and by private urban-development actors. Theoretical analysis is such that it insists on considering the subsurface as a factor with its own specific attributes, such as watercourses, the original rock composition and its degree of artificialisation, or chemical disturbance processes brought about by intensive human action on the land. Yet, at the same time, the underground space also affected by the impact of the growth of cities, as expressed in the building of infrastructure or the direct occupation of sites near the surface for housing, parking and shopping. Also of relevance is the presence of abundant archaeological remains or merely waste found at different levels. All these factors are studied in this paper, which has been prepared by taking a dual geological and geographical approach, between which dialogue is so clearly needed with regard to these issues. Keywords: Urban Subsurface. Urban Planning. Europe. Cities. Urban Areas. Abstract: This paper addresses the process towards integration of subsurface knowledge in urban planning of three cities participating in COST Action TU1206 Sub-urban; Rotterdam, Glasgow and Oslo. The cities have unique challenges to manage conflicts and opportunities in the subsurface in the planning process. The Action has enabled a unique interaction between subsurface specialists and urban planners, thereby contributing to transform the relationship between experts who develop subsurface knowledge, and those who can benefit most from it – urban planners and decision makers. Common challenges are improving planning policies, enhancing the level of awareness of the subsurface in city development and modification of legislation to include the subsurface. Benchmark analyses were carried out among the 3 cities as each is aiming for adapting its urban planning practice and legislation. In our opinion, there are 2 main routes to raise awareness that lead to improved understanding and use of subsurface information in urban planning processes. These are development of a subsurface policy and providing subsurface information. They should lead to enable subsurface knowledge to be widely disseminated in order to manage risks and opportunities, and maximise the economic, social and environmental benefits of the urban subsurface and its services on which cities depend. Keywords: Urban Subsurface. Urban Planning. Rotterdam. Glasgow. Oslo. Abstract: Knowledge of the subsurface is vital in planning and delivering successful construction and regeneration projects. To address this, and other urban subsurface issues in the Glasgow area (e.g. planning, flooding, contamination), the British Geological Survey’s (BGS) Clyde-Urban SuperProject (CUSP) has developed 3D and 4D subsurface models and other geoscience datasets (geochemistry, groundwater, engineering geology). The models based on data from tens of thousands of boreholes and other sources, provide new insights into: Glasgow’s complex geology; impacts of its industrial legacy; and opportunities for harnessing heat from abandoned mine workings. To make the CUSP models, and data, more accessible, BGS and Glasgow City Council, a key partner, have established ASK (Accessing Subsurface Knowledge), a data and knowledge exchange network involving public and private sector partners. ASK promotes digital free flow of subsurface data and knowledge between its partners. Lessons learnt in Glasgow are being shared through a European COST Action (Sub-Urban) focussed on sustainable urban subsurface use, and transforming relationships between those who develop urban subsurface knowledge and those who can benefit most from it; the planners and developers of the cities of tomorrow. Keywords: Urban Subsurface. Cities. Glasgow. United Kingdom. The following presentations have been given by members of TU1206 COST Sub-Urban and can be downloaded below. In February 2016 a seminar was co-organised by the geological Survey of Norway and the COST action TU 1206 Sub-Urban. Here are the presentations given by members of the Sub-Urban group. The conference videos for most presentations are available to watch on YouTube. Playlists of each session are embedded below. The underground of European cities in planning documents: the case of A Coruña (Spain) – Rubén C. L. González, et al. Subsurface Engineering as part of Urban Planning and Design – Fransje.L. Hooimeijer, et al. Interviews with many of the Action participants were conducted during the conference and are compiled in the YouTube playlist below. Other products for dissemination that are produced by the Sub-Urban group will be available here. The Danish City Odense has had a project from 2012 to 2015 where the focus has been the geological and hydrogeological understanding of the subsurface. In Denmark more or less all drinking water comes form groundwater and therefore is this resource of special interest both for the Odense municipality, the Geological Survey of Denmark and Greenland and the water company VandCenter Syd. A report describing the development of a 3D geological and hydrogeological model as basis for the urban water system is available in Danish (coming soon). The Norwegian City Bergen on the west coast has had a project to safeguard the world heritage site of Bryggen in Bergen in 2011 to 2015. The many results from that project can be read in the project report Monitoring, Mitigation and Management.